If you have a farmhouse kitchen sink — and need a wall mount faucet — check out this design from Strom Plumbing. This is the most handsome wall mount faucet that I have ever seen. 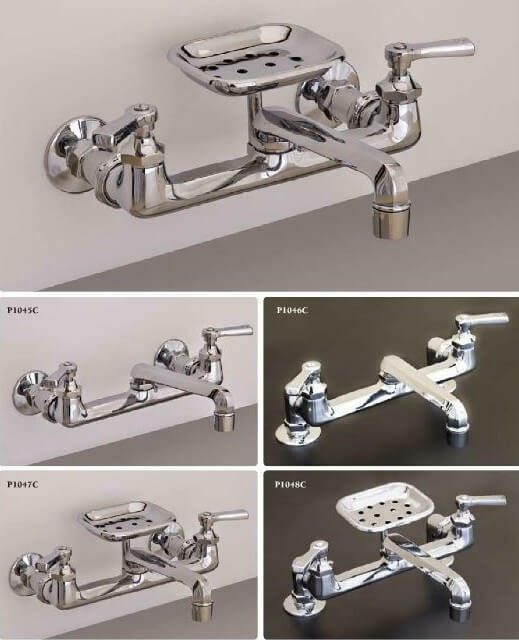 I’ve written about wall mount faucets from Strom before. I like those, sure, but this new design is not so “rounded” as others, there is no embellishment, no frou frou. Instead, this design has a chunky, utilitarian, almost industrial style — better for a mid century kitchen sink, I think. Notice the use of the “hex” shape and hard contoured edges thoughout the design. 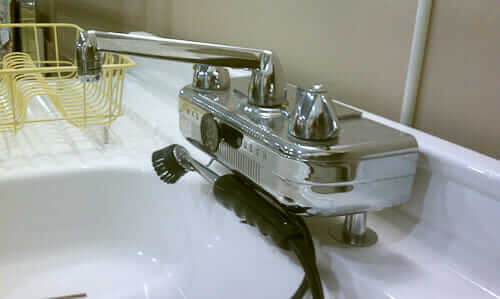 And of course, it’s always cool to have the soap dish attachment — what a terrific retro detail. This kitchen faucet has hunka hunka heft, much like the Mississippi bathroom faucet that I love — also made by Strom Plumbing. I used the Mississippi faucet in two of my bathrooms. They were not inexpensive — but they seem to be terrific quality. I always like a kitchen and bathroom faucet with good “hand feel” — lots of “heft” when you touch them. The Mississippi bathroom faucets certainly have delivered. Note, several readers have pointed out that the smaller, 4″ Mississippi is no longer offered. Drats. I need to do more research on 4″ faucets, although we do have a few. As you can see, you can get this Strom kitchen faucet as either deck- or wall mounted faucet, on an 8-inch spread. You can at Strom Plumbing Sign of the Crab Note, Strom is a wholesaler — you cannot buy from them. If want to hunt this design online, plug the model number into the Google and go from there. See all our research and stories about both kitchen faucets and sinks for a vintage kitchen here. I’ve been reading this blog for some time now, and love it! So thanks for being out there. Posting here because it relates to a project I’m working on. 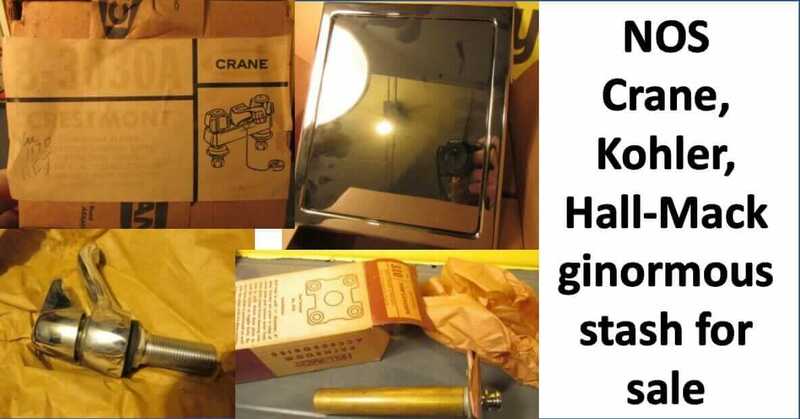 I was looking into how to fix my leaky and worn American Standard wall-mount faucet from the early 50s. My first instinct was to replace the faucet with an acceptable replica, but quickly found it was impossible to find a three hole, cross handle set that was up to par. 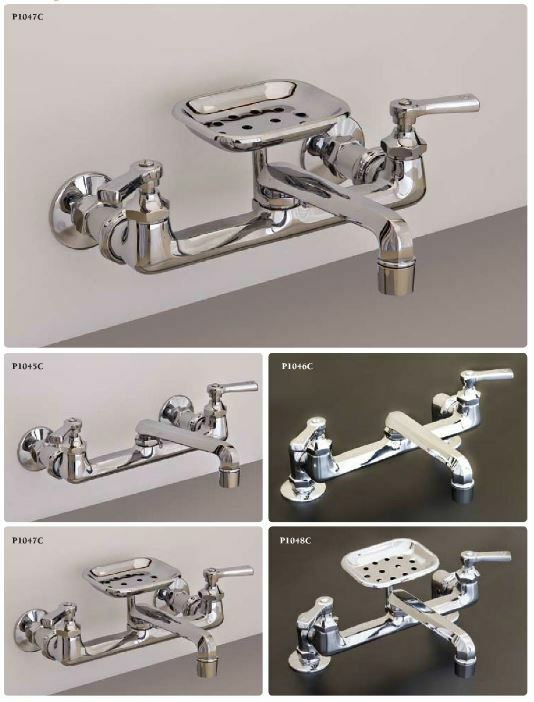 After much Googling, I found Bathroom Machineries, which is an absolutely amazing website dedicated to restoring all parts of the antique and retro bathroom. They have loads of parts for all sorts of wall-mount faucets and other plumbing, which anyone trying to replace a leaky wall-mount faucet will know is not easy to find. They also (this is really amazing) have a boatload of American Standard parts that do-it-youselfers can use to fix and re-trim that leaky old faucet they like so much. Just wanted to share my elated find! Hope others find it useful. And it should be noted that Bathroom Machineries also has light fixtures, electronics, hardware and plumbing for periods from about the 1880s to the 1960s. They seem very passionate about their restoration work. Yes, this is aka deabath.com. We have written about them often. They have been an advertiser for years…. Glad they had what you needed, too! 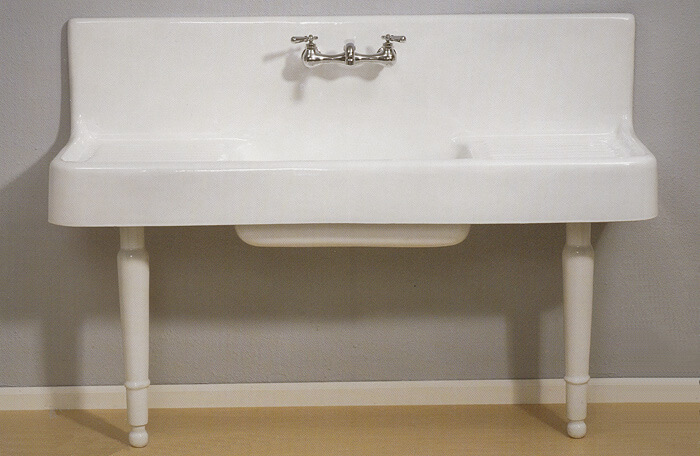 I just purchased an antique kitchen sink (white enamel) one basin and drainage on both sides. Now, finding the faucets seems to be the tricky part. Wish me luck!